The Iranian Film and Video Festival highlights recent Iranian cinema and video that explore the diversity of the Iranian experience through fiction and experimental storytelling. Post screening discussion with curator Sohrab Kashani. Sohrab Kashani is an interdisciplinary artist and independent curator based in Tehran. Sohrab is the founder and director of Sazmanab, formerly a non-profit center for contemporary art and currently a collective based in Tehran and on the Internet. Co-sponsored with the Center for the Arts in Society at Carnegie Mellon University. 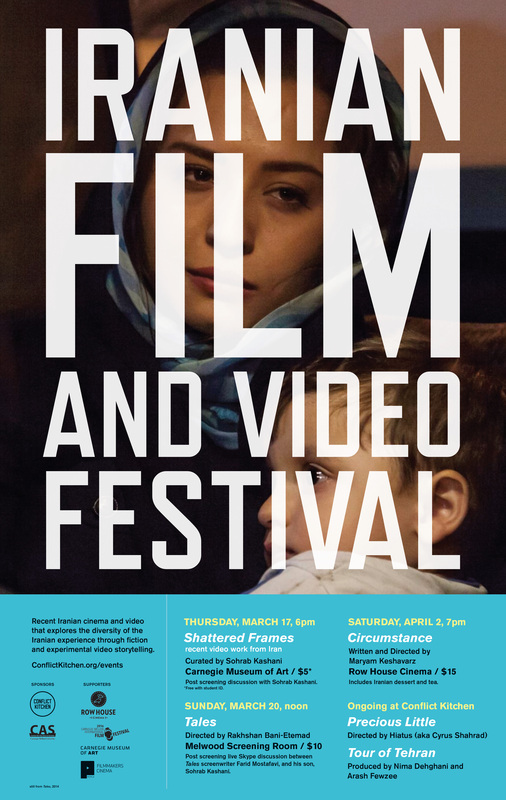 *Screening will be followed by a live Skype discussion between award-winning screenwriter of Tales, Farid Mostafavi, and his son, Sohrab Kashani, an Iranian artist/curator who will be in Pittsburgh for this special event. Winner of best screenplay at the 71st Venice International Film Festival, Tales revisits the characters from Rakhshan Bani-Etemad’s previous films. Ending an eight-year hiatus from narrative feature filmmaking, Bani-Etemad created Tales with no budget or license from the Iranian government and a volunteer crew and actors. Tales weaves the stories of seven characters linked by shared struggles — social, economic and political — into a film that is both a microcosm of Iranian working-class society and an incisive, luminous portrait of human fallibility and virtue in the face of everyday challenges. Writer Farid Mostafavi is an Iranian screenwriter best known for his social realist films set in urban Tehran. Mostafavi attended the Institute of Cinema and Television in 1974 and studied economics at Tehran University. He worked in Iranian television between 1983 and 1989 and has been working as a screenwriter in Iranian cinema since 1985. His films include Under the Skin of the City, Women’s Prison, Mainline, Gilane, Crossroads and Tales. In 2014, Mostafavi won the Silver Lion at the Venice International Film Festival for Tales. He lives and works in Tehran. Presented in partnership with CMU International Film Festival. Teenagers Atefah and Shireen are in the midst of a teenage romance, negotiating their families’ expectations and their own desires. Set in Tehran, Circumstance bobs and weaves between what is authorized and who is ostracized, what remains private when disavowed by the public and the fundamental denial of the reality of two young women. This is the first full-length feature film from Maryam Keshavarz and winner of the Audience Award at the 2011 Sundance Film Festival. Hiatus’ father is the unknowing star of a short shot on his phone during a trip to the island of Kish in the Persian Gulf and a visit to Hiatus’ grandfather’s grave in Behesht-e Zahra, a cemetery south of Tehran. Take a virtual tour to Tehran while traveling south to north of ancient mansions and modern malls. Ask for the goggles at Conflict Kitchen’s order window. Born in Mashhad, Iran in 1989, Arash Fewzee is an New York-based artist working in photography, video and installation. After finishing his bachelor of science in economics in Iran, he relocated to New York to study art at The New School of Design at Parsons. His work focuses on the relationships between economic forces and art markets artist and art institutions; and mobility of objects and circulation of images. Nima Dehghani is a multidisciplinary artist, writer and architect, born in Tehran, Iran in 1986. Humans, communication, individual conflicts and social discriminations with allusions to politics have been the subject of most of his work. With a background in architecture and theater, he strives to build the most comprehensible virtual venues to convey his thoughts and focuses on the notion of displacement, home, diaspora and the purest relationship between human and space: Migration. Working predominantly in performing arts and digital media, Nima’s research revolves around the core of Middle Eastern studies, social behavior in online networks and performativity of social actions.